It's back again! 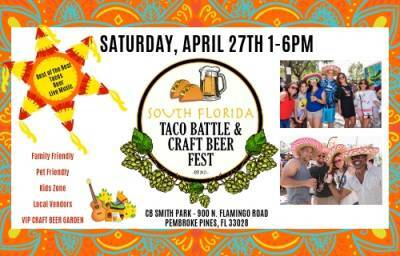 SOUTH FLORIDA'S BIGGEST TACO BATTLE & CRAFT BEER FESTIVAL takes place at CB Smith Park in Pembroke Pines on Saturday, April 27TH 1-6PM! The annual battle brings together local restaurants and craft breweries for a challenge that will showcase the BEST TACO culinary skills and BEER MASTERS of South Florida! This is a FREE event for the whole family! Get ready for Good Food, Great Drinks, Live Music, Lively Taco Eating Competition, Local Vendors, Kids Zone and just a Fun Atmosphere all around! PLEASE NOTE: EARLY BIRD SPECIALS WILL END 3/23 at NOON! PRICES WILL GO UP! !